The first impression that you gave was not a flattering one, and it mostly had to do with your infamous smog. I waited patiently as our flight pilot announced our descent into your heartland that is Beijing. Then I waited. And waited. And then I waited some more. I began to wonder why we were circling in the sky for what felt like eternity. As soon as we emerged from the clouds, we landed in the airport within a minute. I finally realised that we hadn’t been in the clouds for all that time; we were in the smog. You covered yourself with this sickening stuff for the first two days of my stay, and it was honestly very depressing. Thankfully, a thunderstorm unveiled your natural face. You draped yourself with blue sky, and put on a hint of gentle breeze. Much better, I thought. Some of our time spent together made me feel like a tourist. For instance, I would have loved to stay with you longer during the Tiananmen Square visit. For someone who is born and raised in Hong Kong, the Tiananmen Square massacre in 1989 marked how I feel about you in so many ways. As I looked up in the Square, I met the judging eyes of a number of surveillance cameras on the light poles. I looked down, and saw the ground on which thousands of students stood twenty-five years ago. I looked at my watch, and it was time for our group to go to the nearby Forbidden City. There was no time to dwell, to soak it all in. Not even enough to finish a cup of tea. Although I had a few photos to show for it, they are not the same as physically being there at the Square. This was one of my regrets. On the other hand, I was glad that we had some quality time at the Great Wall. As we say in Chinese, bù dào cháng chéng fēi hǎo hàn (one who has not visited the Great Wall cannot consider himself as a great person). What began as an attempt to thwart the invasion of northern nomadic tribes became an integral part of your identity, and that of your descendants. For thirty-two years, I have been waiting for this chance. It finally happened, and you did not disappoint. Where do I begin? The steep, twenty-minute ascent; those uneven and somewhat broken steps on which countless have climbed; the feel of antiquity; the somewhat low arch of the entrance which reminded me that I am probably taller than the average Chinese Joe back in the day. There I was, standing at one of the highest points to drink in the nearby mountain ranges. I felt the burning heat of the sun through the baked bricks underneath my hand. So, this is how it feels. On our way down from the Great Wall, a middle-aged lady by the roadside was selling beverages. “Cold water, cold water!” She yelled in her heavily-accented English. Perhaps due to my British-trained politesse, I instinctively replied in Mandarin: “No, thank you.” Much to my surprise, she shot back in Mandarin with her northern accent: “I wasn't talking to you!” I immediately realised that her target was my non-Chinese companions who were next to me. As much as I felt like I was on foreign land, then I was just another yellow-skinned Chinese man to the vendor lady. You are funny that way. After my brief visit with you, many would ask me about your relationship with Christianity, and in particular the Catholic Church. How should I describe it? A word often used by young people nowadays would do: “It's complicated”. It cannot be explained in a black-and-white manner. This may be unsettling for some, but such is the reality of you, and also that of the Church. Perhaps it has to do with that “Middle Kingdom” mentality of yours: You come to me, but I don't come to you. Such is your cup of tea. This balance between proclaiming the Good News and not rocking the proverbial boat is certainly not for the faint of heart. Speaking of Christianity, your church buildings make for an interesting tale. The old, along with the renovated ones understandably have a European feel; that being said, what is with the new churches that followed the same design? Forgive my bluntness, but these new church buildings are also painted over in a way that makes them look like Lego sets. In other words, they may look European, but they do not have the elegance of the European churches. Do you still associate Christianity with foreigners? How do you feel about the relationship between the Christian faith and Chinese culture, or at least the more classical Chinese culture as we know it? Where is the Chinese soul of the local churches? To be fair, the concept of enculturation remains foreign to many people. But you should at least look into it. There is a way for you to express yourself in the Christian faith. How that is to happen, it is for you and I to figure out. Edmund with a descendant of one of China's early Christian martyrs. This is not to say that good seeds have not been sown in your soil. You have given birth to many who died for the faith, especially during the Boxer Revolution in 1900. I had the privilege to visit one of the churches at Zhujiahe in rural China, where three of its parishioners drank the cup that Lord Jesus drank and became martyrs. 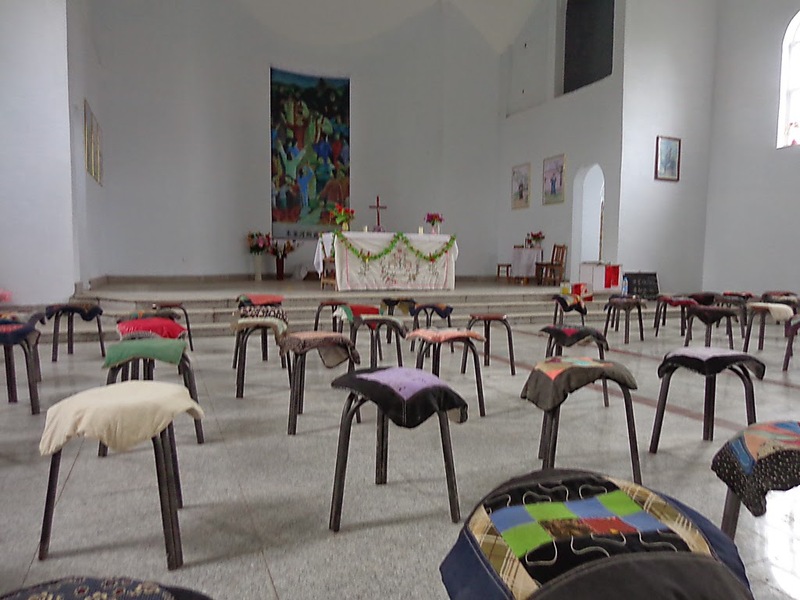 The church itself was half-filled with stools that had home-made cushions on top of them. It was humble, yet it was faithful. I managed to take a photo with the great-granddaughter of one of the martyrs. Her mere presence was a living testament of the perseverance of faith. Despite everything that goes on, something continues to happen in you. Ten days. That was all I had to spend with you. History. Culture. Religion. I could have learned about you through textbooks, but meeting you in person makes for a much more organic tête-à-tête. By no means was our encounter comprehensive, but it didn't have to be. If anything, the Chinese culture and the heart of Christianity share one thing in common: Building friendships. Friendship with each other, and friendship with God. This takes time, but it has to begin somewhere. Who knows? We may have another cup of tea together soon enough.